Horn or bag strap. 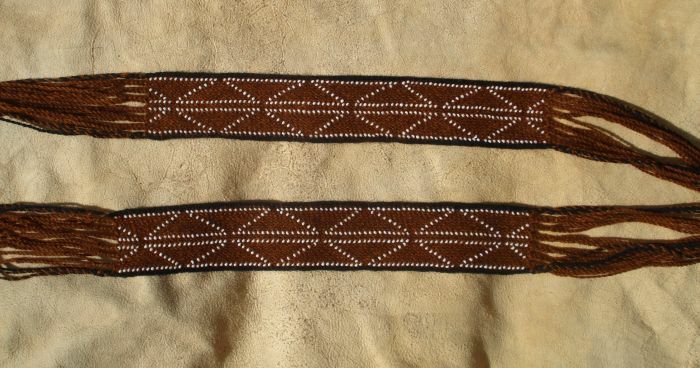 1 1/2" x 48" The beads are woven into this strap to create the design. 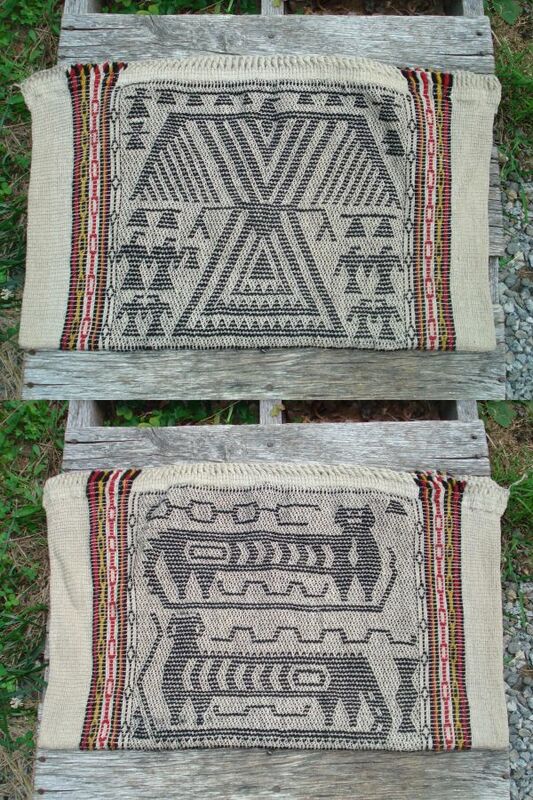 This type of weaving is good for all time periods going back as far as the 1740's. The brown color is achieved with madder root dye as are the more well known madder reds. The different color comes from how the dye bath is prepared and changes in heat. Braintan thongs for attaching to a horn included on request. Click on image to enlarge. 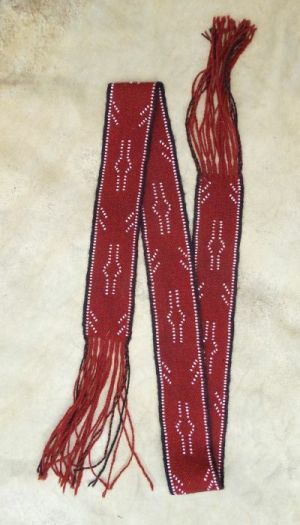 A version of a sash from the Memorial Hall Collection at Deerfield, MA. To keep the cost down this sash is 3 x 32 plus fringes, rather than the 72" w/o fringes like the original. The shorter length is in keeping with most surviving sashes from the 18th century. 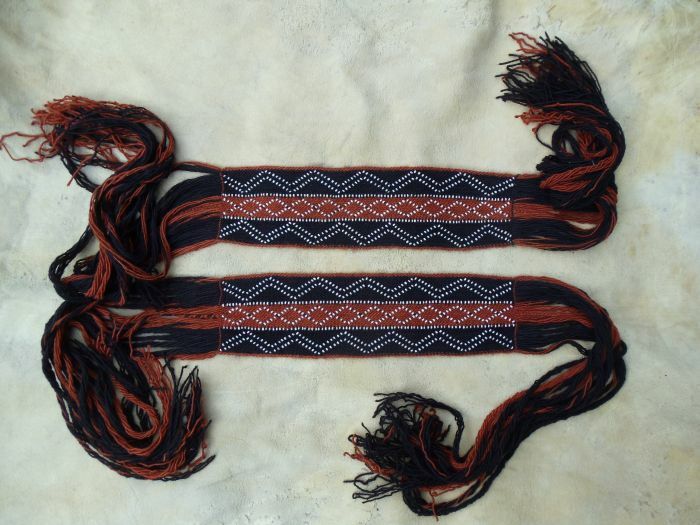 "Eunice Kanenstehawi Williams and her husband Arosen reportedly gave this sash to Eunice's brother, the Reverend Stephen Williams of Longmeadow, Massachusetts. Eunice and Stephen had both been captives of the 1704 raid on Deerfield, Massachusetts, but Eunice elected to remain with her Kanienkehaka (Mohawk) family at Kahnawake in Canada. Date: 1700 - 1750 Topic: Personal Materials: Wool, beads, hemp Dimensions: L: 72 in. (182.8 cm. ), W: 3 in. (7.6 cm.) Accession #: IR.A.24" Madder dyed and beads woven in on hemp thread like the original. From an original in the American Museum of Natural History in NYC, this bag is made using hemp cordage and wool yarn. Woven with a method called twining. 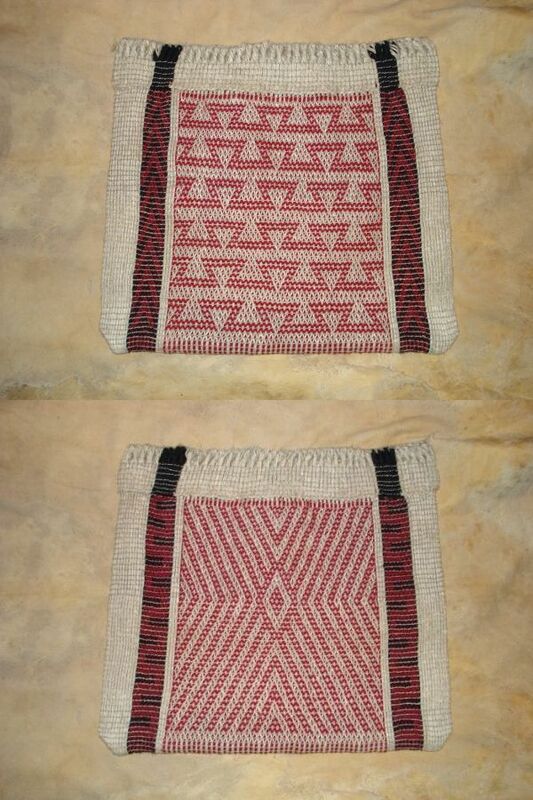 Bag is Approx 17"W by 14"H. Used for storage and as medicine bags these "panel" bags begin to show up in collections as early as 1800-1809 in the Grant collection and seem to peak around the end of the 1800's and disappear around 1930. The techniques and various warp arrangements show up in a very few remnants of fabric and as impressions on pottery sherds from the Mississipian culture (600AD to 1600AD). Based on wear, some scholars say these bags may have been being made as early as the mid-18th century but, the earliest documented are in the first decade of the 19th century. Like on fingerwoven bags, the designs are almost always different on each side of the bag. Horn or bag strap . Again dyed with madder root but with a different heat giving it a rich brown color. 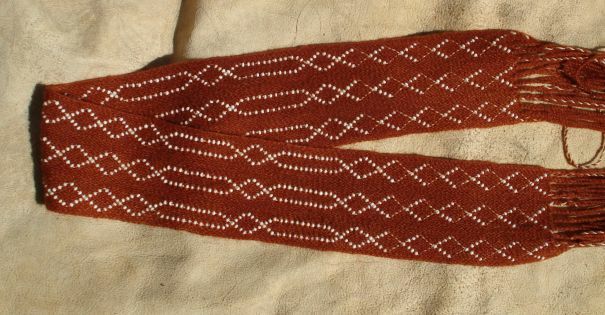 The pattern is adapted from a sash at the Rochester Museum & Science Center. 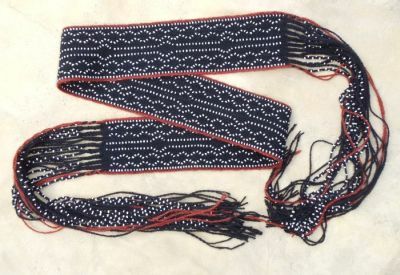 This short fringed sash, or strap gets it�s bead design from a pair of Great Lakes garter drops collected around 1780. 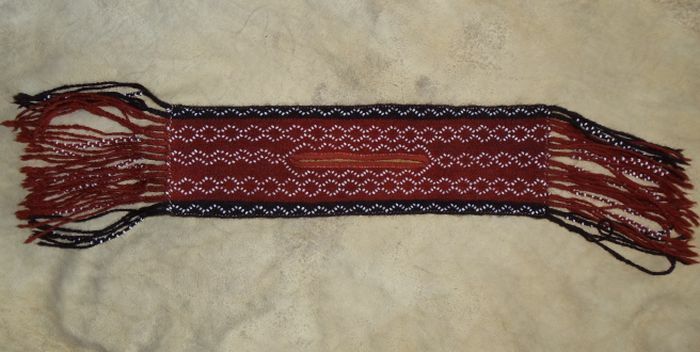 The small yarns are typical of nearly all weaving from the 18th and early 19th centuries, with the yarn and beads often being even smaller than used in this piece. Especially in items thought to be later in the over-all period. The heavily beaded fringes are seen quite often and add a lot of style to these pieces. 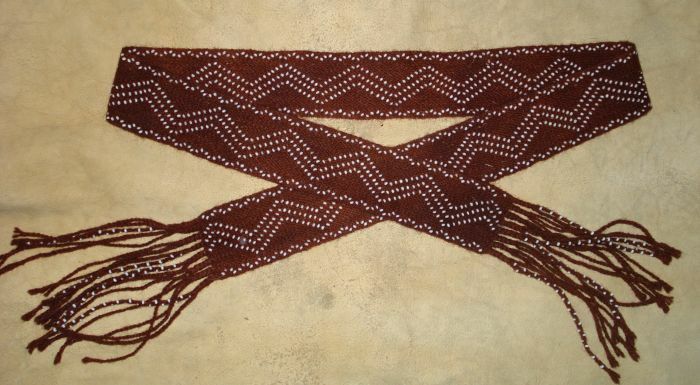 This sash has over 2000 beads woven into the body and another 1200 on the fringes. Made from hemp cordage. Very tightly twined band is 2" by 22". Oblique woven tails are 10' long with the last 3' split. 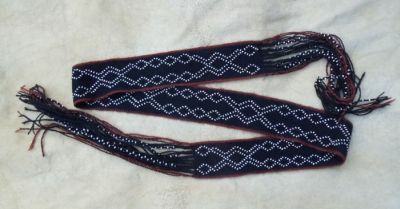 This tumpline is constructed in the same way as the fancy moosehair embroidered ones made by the Iroquois and Huron in the 18th century but w/o the fancy designs done by wrapping dyed moosehair around the wefts. I've been making these for about 15 years and the first ones are still in service after some very heavy use, not only for carrying loads but also for dragging toboggans, deer, etc. Used as 'rope' to hang large game or tied between two trees to hold canvas for shelters. Pretty much what ever you can think of. At 22' total length the uses can be pretty varied. Copyright © 2006 Conde Trading. All Rights Reserved. Site Design and Hosting by Historical Enterprises.